A day of disquietude settled by evening rain. It felt it should rain all day, and it was supposed to. The day started out cool and damp and breezy, but by afternoon all clouds were tucked away, it was warm and humid, it felt all wrong. Then, an overcast, a cool breeze. Mist drifted through the red budding leaves of the chokecherry trees. But still, hours before the rain arrived. Now, the sky is dark with storm, and I welcome it. At nine-fifteen it should be dark, but with the sun staying up ’til nine-thirty or so, and the light lingering on for hours after, well, this time of year I rarely see the dark, and the dark is quieting. The storm is quieting. The thunder is quieting. All day plenty to do, but no direction, no focus, waiting for the rain. Two of the five spruce I transplanted in the fall are looking dry and brown. Last night I transplanted a four-foot white pine and a smaller serviceberry that came up with it. The three serviceberries I moved last year are dead. Down at the river this morning. Rain on young leaves, rain on water, rain on the needles of thick, old cedars. Perhaps, finally, the rain has ended. Tonight’s sky is low with soft grey velvety clouds. Everything is lush, damp, beaded with drops of rain. The field is alive with color—smudged pinks, brushes of crimson, dapplings of light green and yellow—all the young buds and leaves. The evergreens are dark and broody, many sporting small, hard, dusty gold cones. The grass and weeds and wildflowers are growing strong; I mowed before the rain and now must mow again. The trees are not yet full, and it is fine to see the birds among the vibrant branches. This evening, a flock of goldfinches decorate a crimson chokecherry, and robins are making the rounds, flashing their ruddy orange through the green. On this morning’s walk to the river I trailed a bird I’ve never seen before. It was flitting from old flower head to old flower head and once in a while going down into the grass then lifting itself up. It had a black head, a buff-colored belly, and its dark breast and wings were marked with bands of orange and yellow, most colorful when in flight. The size of a finch or wren. I saw it again tonight when making dinner and went out to get some pictures, none of which turned out very well. For the first time in three years, I am not looking forward to the farmers market. This morning found a patch of Dutchman’s breeches. Now to find the Dutchman! A patch of breeches left behind by the Dutchman. What a pleasure to mow after dinner! (And I will say that only this once, I’m sure.) Cool and breezy, sun lowering in the west-by-northwest sky. The grass grew an inch or so in the rain, and this time of year usually if you lose a day, you lose a lawn. I’ve thrown a sheet over the clothesline to block the sun so I can sit out here on my gravel porch and write. There are so many birds! Goldfinches, juncos, yellow-dappled wrens, American redstarts (the mystery bird from yesterday), and towhees. Three hummingbirds circle the feeder—the one who “owns” it has been very diligent about chasing the other two off, but one of the interlopers has been mighty bold, even sitting on the roosting bar for a second. Oh my gosh! You’d think he’d committed a cardinal sin or something! Such a fuss. One of the problems with identifying the redstart was, I believe, my description of the bird’s behavior. When I saw it, it was flitting about the field, seemingly picking seeds off the old wildflower heads. What the bird was actually doing was flushing insects from the grass then nabbing them in mid-air. Aha! Just like a redstart. Then, the world stood still. A deer spotted Elliott hunkered down at the edge of the lawn. The deer stared at Elliott for quite a while, neither of them moving, then the deer seemed to move on, but all it did was to circle around in front of Elliott, continue to stare, nibble at the grass, stick its nose forward, sniff, move forward a step or two, move its ears back, move its ears forward, stare, take another step, do it all again. Oh my gosh. Get on with it. When about 10 feet away, Elliott stood, slowly, and turned. 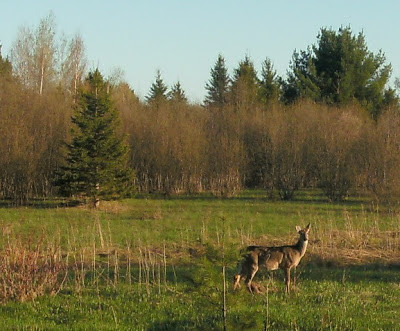 He ambled this way then that, away from the deer, with the deer following, but keeping its distance. Suddenly Elliott dashed over to the garage, not too fast, but not too slow, either. From the garage he walked on up to the house, and when I opened the door, right on in. The deer went back to grazing. An overnight frost came in like the cops busting up a party. Such a dread for tomorrow’s farmers market. I should eat my words, what I wrote Friday about the farmers market, but I won’t. It was a great day and I enjoyed my new spot at the market, but that doesn’t invalidate Friday’s dread, and the more people I talk to about the forced move of my booth to a quieter area of the market, the more I realize this. My brother-in-law, a 30-some-year veteran of art fairs throughout the western states, was one who sympathized with my plight, and one thing he said has resounded: Any art fair or farmers market is a collaboration between those running the show, the vendors, and the customers. Yesterday, when my customers showed up and bought beeswax and chatted or just chatted without buying beeswax, all was right with the world. And, as always, there were many interesting conversations. Like about making bullets. Yes, I talked to a guy who makes his own bullets, and he needed beeswax to toss into the molten lead because, well, who knew that some people make their own bullets? Who knew that beeswax pulls the impurities from the lead used to make these bullets? And who knew that pure lead is crucial for a sound bullet? I also talked to a woman who not only knew the town of Aledo, Illinois, where I was born, but she has actually been there many times. And from her husband I learned my corn candle is actually a field corn candle. Of course this all might have been different if the weather had not given us an absolutely gorgeous day with full sun and just the lightest breeze off Lake Superior to keep it fresh. A day like that coming on the summer’s first holiday weekend jostles most everybody into a good mood, and people will tend to stroll happily through every nook and cranny of the farmers market on a nice day. Yes, there were times when the outer ring was barren of customers and a look back to the main area of the market showed you where the crowd was (heck, they’ve got live music over there), and come a rainy day or a cold day or a rainy, cold day with a biting wind, well, that’s not today, is it. All day yesterday I gladly took in the commiseration offered me by other vendors and learned that some had either been asked to move or otherwise learned they were going to be moved, and when they balked, well, they didn’t get moved, so either I did something wrong or my “Hey, wait a minute! You can’t move me!” came at exactly the wrong moment for those who run the show to give two flying hoots. But this information about others being able to abort moves directly contradicts what I was told by those running the show—that all vendors are treated the same. So. Well. There are always a few missing pieces, aren’t there? I found it interesting that many customers thought I had asked to be moved, assumed my new spot was my choice. 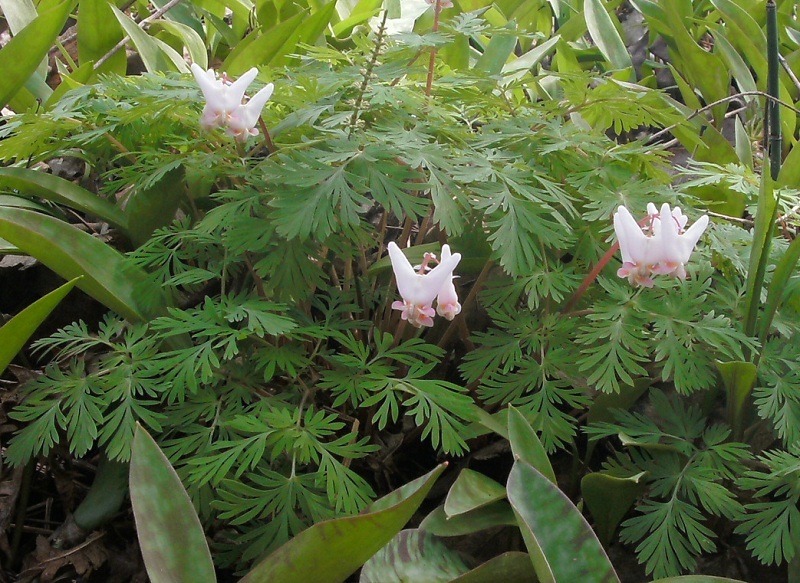 And, because of the patch of Dutchman’s breeches I found earlier in the week (oh! to find that Dutchman! ), I played this video before I even left home. Buckle down, Winsocki. Special Report: Peepers trump can of worms!